See employee satisfaction and energy savings skyrocket with crisp and clear e-conolight LED lighting. For workers who spend up to eight hours a day at their computers, a natural and relaxing environment is crucial to overall well-being and productivity. LED lighting simulates daylight, reducing complaints of glare, eye strain, and fatigue. Meanwhile, crisp outdoor lighting improves both employee and visitor safety in parking lots and along walkways. Energy and maintenance costs? Dramatically reduced by up to 90 percent, inside and out. 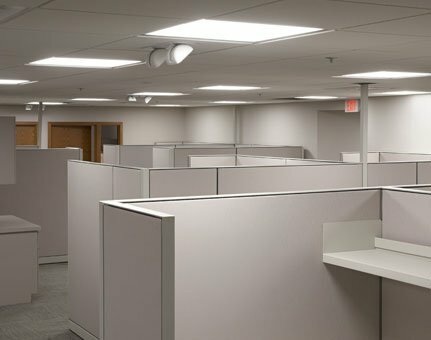 Downlights in conference rooms and hallways help create a more productive work environment by eliminating glare and distributing bright light evenly. Maintenance costs are reduced by up to 90 percent. LED area lighting in parking lots improves nighttime visibility by emitting uniform, shadow-less light that increases safety when employees and/or visitors walk to and from their cars at night. LED troffers and flat panels reduce glare, eye strain, and worker fatigue by making conference rooms and hallways look and feel like daylight. Productivity increases, while energy costs are cut in half. LED bollards emit crisp and even white light that increases safety along pathways by allowing easy identification of suspicious activity.